I use a $60 variable speed DA from Harbor Freight with Maguires microfiber cutting and polishing discs and their Microfiber correction compound and finishing wax. It takes 99% of the swirls and scratches out. You most certainly do not need to spend hundreds of dollars on a DA. Just take your time and you good pads, compounds and polishes. To wash, clay bar, re-wash, correct, polish and detail spray a full size truck takes me a good 6 hours. I do. Would like to change it for something a bit more aggressive but not so loud you can't listen to music or have a conversation. Looking at the Flowmaster American Thunder series with duals straight out the back. What about you? Shift into Drive for interstate travel. My truck rarely sees V4 mode at 70mph - 75mph. Not using any more gas than you just by shifting into drive. My truck is rarely in V4 on the highway. At 75mph the engine load is usually enough due to drag to keep in V8 mode. Since getting your tune, have you needed service at the dealer for anything drive-train related? Just curious if the dealer said anything about the tune. The warranty is the only thing keeping me from getting a tune. My truck is quite a bit more expensive to tune than yours. I have the 6.2L with the 8 speed. I need to send the TCU to HP Tuners to have it unlocked before it can be tuned. To disable AFM just shift into manual mode and select gear 5 if you have the 6 speed. Like magic, no more V4, and it won't cost you a dime! AdioSS said "I really hate that 98mph speed limiter! I’ve got 420 horsepower! Let me use it!" Driving slow has NOTHING to do with having only 30% of your power available off idle. That would be acceleration. AdioSS is talking about top speed. The fuel cutoff limits your top speed. If you were limited to only 30% of the total 420hp because of drive line loss for instance, your top speed would then be limited to how much drag 126hp could overcome. Please do not be offended by this because I think you really know your stuff. Your grammar, punctuation and the "train of thought" style that you type in can make it very hard to follow and understand what you are trying to say. Not just in this post. I have read hundreds of your posts and most are difficult to grasp. You have a tremendous amount of knowledge, it just doesn't present very well. Nope. 420HP and 460lb ft at the crank which is what Adioss was referring to. Probably 320ish at the wheels. Torque management has nothing at all to do with how much power the engine makes, just with how it is put to the ground. 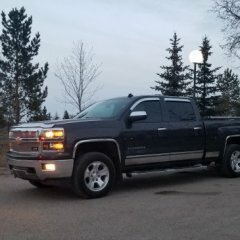 My current truck has the GM soft tri-fold. I hate the thing. I lose 1/3 of my bed and it leaks like a sieve. Probably going to replace it now that winter is over. Continental Terrain Contact AT. Have had them for about 3500 miles now. Great tire! As far as I know, the brackets are part of the storage box kit and not available individually.